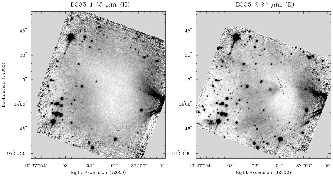 Figure 1.9: Near infrared images of B335, which is Class 0 source. Figure 1.10: Line profile of CS line radio emission. Model spectra illustrated in a dashed line (Zhou 1995) are overlaid on to the observed spectra in a solid line (Zhoug et al 1993). Figure 1.11: Explanation of blue-red asymmetry when we observe a spherical symmetric inflow motion. An isovelocity curve for the red-shifted gas is plotted in a solid line. That for the blue-shifted gas is plotted in a dashed line. Taken from Fig.14 of Lada (1999). where represents the systemic velocity of the cloud (line-of-sight velocity of the cloud center) and is the angle between the line-of-sight and the position vector of the gas element. The isovector lines, the line which connect the positions whose procession/recession velocities are the same, become like an ellipse shown in Fig.1.11. An isovelocity curve for the red-shifted gas is plotted in a solid line. That for the blue-shifted gas is plotted in a dashed line. If the gas is optically thin, the blue-shifted and red-shifted gases contribute equally to the observed spectrum and the blue- and red-shifted peaks of the emission line should be the same. In the case that the gas has a finite optical depth, for the red-shifted emission line a cold gas in the fore side absorbs effectively the emission coming from the hot interior. On the other hand, for the blue-shifted emission line, the emission made by the hot interior gas escapes from the cloud without absorbed by the cold gas (there is no cold blue-shifted gas). As a result, the blue peak of the emission line becomes more prominent than that of the read-shifted emission. This is the explanation of the blue-red asymmetry. 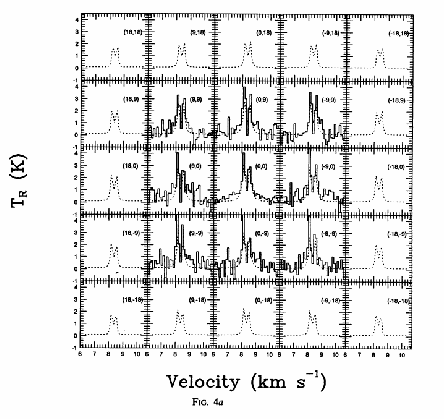 In Figure 1.10, model spectra calculated with the Sobolev approximation (Zhou 1995) are shown. These show the blue-red asymmetry (the blue line the red line). 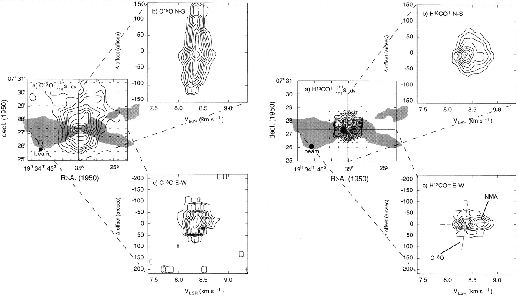 Figure 1.12: C O total column density map (left) and H CO channel map (right) of B335 along with the position-velocity maps along the major and minor axes. Taken from Fig.3 of Saito et al (1999). 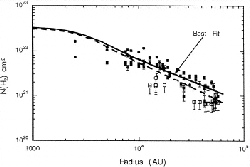 Figure 1.13: Column density distribution derived from the H CO and C O data taken by the Nobeyama 45 m telescope. 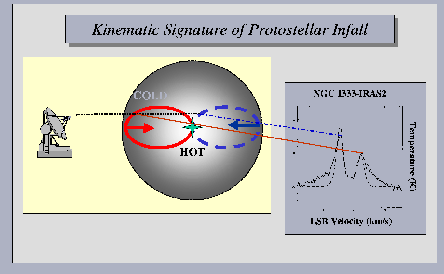 Taken from Fig.9 of Saito et al (1999). where they omitted the data of since the beam size is not negligible. Similar power-law density distributions are found by the far IR thermal dust emission.